Firmware Updates for Nokia 5800, 5530, X6 NOT cancelled, just delayed. I had some emails about some updates being cancelled for the Nokia 5800, 5530 and X6. These were the updates Nokia Conversations told us about, providing new maps and new Anna browser amongst the other additions. Note, the official word from Nokia is that these updates are still coming for those devices, BUT it will be delayed. we have not cancelled those updates. 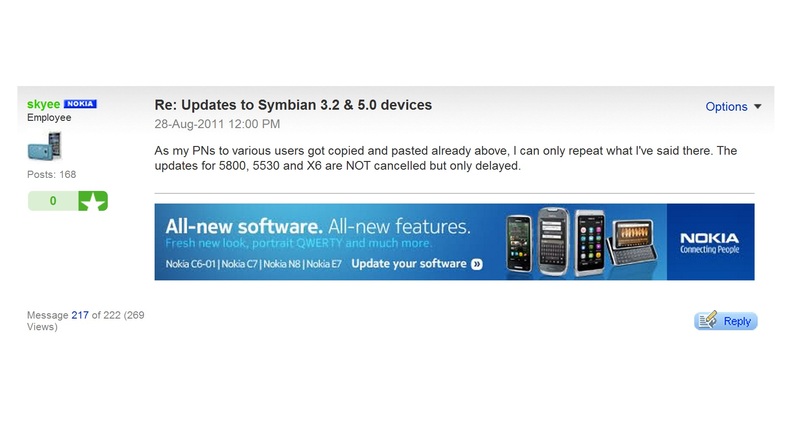 I have been informed that the Conversations blogpost talking about Symbian 3.2/5.0 updates got edited, but we are still working on getting the update also to 5800, 5530 & Co. – they are only delayed. I’ve been informed as well yesterday that somebody has edited the conversations blog article. The updates for 5800 & co. are currently delayed – we’re still working on them though. But it will take some more time until they will be available. As for the flagship Nokia N97, NO that still will not get the update. That’s what you get when you pay the premium, huh? The quicker that suckfest of a phone is forgotten, the better.